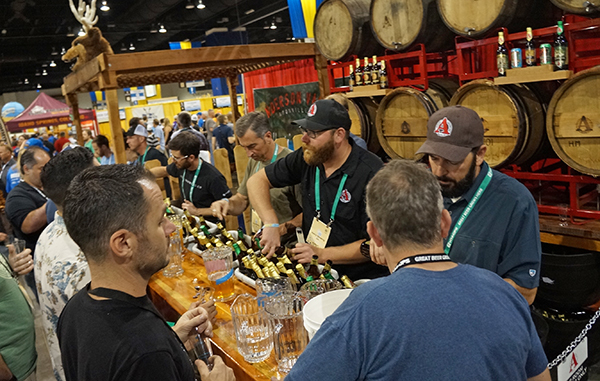 The Avery Brewing Co. pours out sample beers at GABF. Photo by Amy DiPierro. The Great American Beer Festival poured over downtown Denver this weekend. From Thursday through Saturday, the streets around the Convention Center frothed with beer fans, many wearing necklaces strung with pretzels to nibble between sips. Denver drinkers weren’t the only local winners. Colorado breweries took home 36 medals in the annual competition, just short of last year’s statewide medal count of 39. Longmont-based Left Hand Brewing Co. was among the winningest breweries at the festival. Its beers earned one gold medal and two bronze medals. Another Colorado standby at this year’s festival was Boulder’s Avery Brewing Co., which added a silver medal to its collection this year. Judges snubbed one beer category entirely on Saturday – suffice it to say that if you’re looking for a winning pumpkin beverage this fall, it’s best to stick with lattes over beer. The three-day beer love-fest brought together 750 breweries from across the United States, more than a fifth of them from Colorado.